With the launch of CodeMeter Embedded 2.1, Wibu-Systems introduces a new structural and business model that allows intelligent device manufacturers to download an SDK specific to their operating system and architecture within 24 hours of their request and quickly start testing the only secure licensing solution in the world that supports all leading industry platforms. Embedded World visitors can learn more and request their CodeMeter Embedded SDK of choice at Wibu-Systems’ exhibit, in hall 4, booth 360. 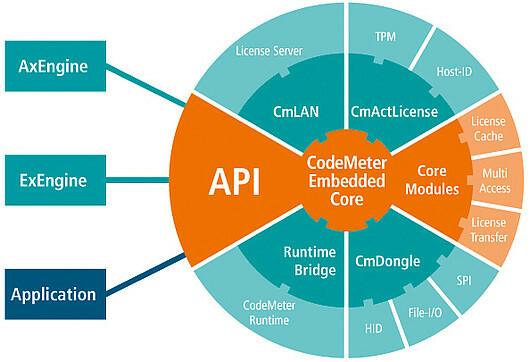 CodeMeter Embedded is a lean runtime environment for embedded systems. The immediate availability of the new version 2.1 is sure to keep the engagement of project teams high, but this is not the only novel aspect: embedded software developers can select among a broad list of preset SDKs, each consisting of one static library for every combination of supported operating system and architecture. CodeMeter Embedded 2.1 has been successfully tested to work with Android, Linux, QNX, VxWorks, and Windows from an operating system point of view, and with ARM, PowerPC, and x86 from an architectural standpoint. CodeMeter Embedded is made available in binary (compiled) form; Wibu-Systems’ clients can use their compilers/linkers to integrate these into their (protected) applications. CodeMeter Embedded 2.1 also interfaces seamlessly with all of Wibu-Systems’ secure license containers, including the latest generation of secure hardware elements, CmStick/B and /BMC (the new elegant and robust metal casing form factor that comes with or without flash memory in the exact same design) and CmActLicense, the software variant that binds to a digital fingerprint of the target system. In the event of CmActLicense use, Wibu-Sytems’ clients should adjust the retrieval of the digital fingerprint and the storage of the license files to their target devices. Moreover, CodeMeter Embedded 2.1 can be associated with AxProtector CmE and ExProtector, the software tools that protect against counterfeiting, reverse engineering, and tampering, and CodeMeter License Central, the database-derived solution for creating, delivering, managing, and monitoring software licenses. At Embedded World, Wibu-Systems is also bringing its value-added security and licensing solution for VxWorks. As their cooperation continues to morph and evolve over the years, Wibu-Systems and Wind River, an Intel company, have refined their comprehensive turnkey solution for VxWorks that encompasses integrity protection, authenticity, IP and copy protection, certificate management, license and entitlement management, and hardware, software, and cloud-based key storage. At the same time, the collaboration of Wibu-Systems with Intel continues to strengthen: CodeMeter has successfully passed the enablement test for SGX, Intel's architecture extension designed to increase the security of application code and data. Currently available for Windows and soon for Linux and the cloud, CodeMeter uses SGX enclaves to keep the binding properties safe in memory during runtime and enable even better licensing and software protection. Oliver Winzenried, CEO and founder of Wibu-Systems, sees the role of his company as the security catalyst for the embedded age led by Industrie 4.0: “M2M networks are entering a phase where remote control, monitoring, and maintenance are happening on global-scale networks with a plurality of vendors involved. Any technology that wants to become a de facto standard needs to provide interoperability and intercommunication between all present and future embedded systems. With CodeMeter Embedded 2.1, we bring usability, monetization, and cybersecurity to a new level for all mainstream platforms”.